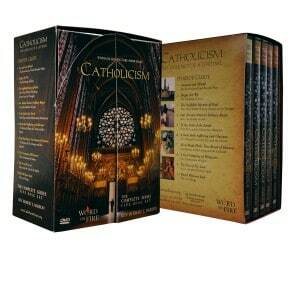 The Catholicism DVD series by Fr. Robert Barron has taken Catholic parishes by storm. In case you haven’t heard of it you should check out. Below are some clips from YouTube of Fr. Robert Barron. Buy the Catholicism DVD series right now. As you can see Fr. Barron is a great evangelizer who makes the Catholic faith easy to understand. You can buy the DVD series yourself or there is a book you can purchase which is a companion to the Catholicism DVD series. Again, I highly recommend these videos to help you grow in your Catholic faith or even for people who are new to the Catholic Church and want to learn more about the church that Christ founded. CAN I A CATHOLIC MAN MARRY A GIRL WHO IS NON CATHOLIC IN ST JOHNS CATHOLIC CHURCH WHERE THERE IS A RULE THAT SAYS MARIAGE WITHNO DIVRCE WHO GAVE THE CHURCH THIS RULE ?